Palm devices aren’t designed to be just cool little computers, although they’re definitely cool little computers. They are designed to do useful things for you as soon as you take them out of the box. The standard Palm Computing applications don’t have to be installed, configured, or fussed with in any way — they’re ready to use with one press of a button. You can configure the preferences for the applications, of course, to get them exactly the way that you want them. To get started, just press the button assigned to that application or tap the Applications soft button for a list of your Palm Computing programs, and then pick the one that you want to use. Address Book: This is your “little black book” of names, addresses, and phone numbers. You can keep a detailed description of everything that you need to know about the people in your list by attaching a note to each record. You can also keep track of everyone’s e-mail address, and you can use the Address Book as your personal address book for e-mail that you compose on your Palm device. Calculator: The calculator is a simple tool for punching in numbers and performing arithmetic. 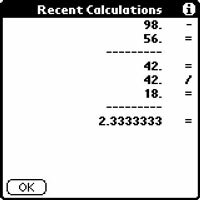 The Palm calculator does one trick that a handheld calculator can’t handle, however: It shows a list of recent calculations. After performing a series of calculations, tap Menu and then choose Options–>Recent Calculations to see a recap of your last few calculations, as shown in Figure 1. Figure 1: You can see a series of calculations on your list of recent calculations. Date Book: Think of this program as your calendar of appointments and events. The Date Book, as shown in Figure 2, lets you set appointments and alarms to remind yourself of those appointments. You can also add notes to any appointment to keep details about each appointment handy. Figure 2: Stay on schedule by using your Date Book. Expense: This is a program for keeping track of what you spend. The Expense program synchronizes, or matches up, the information you enter to special Microsoft Excel spreadsheets on your desktop computer, enabling you to collect expense figures on the road and then pull them together when you get home. HotSync: This program links your Palm device to your desktop computer. The HotSync program has two parts: the part on the Palm device and the part on the desktop. Either a PC or a Mac can synchronize data with the same Palm device, although the PC and the Mac need different desktop software. Mail: This simple e-mail program enables you to HotSync your e-mail with your desktop computer so that you can read e-mail, compose replies, and create messages to be sent through your desktop e-mail system. Memo Pad: The Memo Pad is your collection of plain old text notes that you can keep around for future reference. Figure 3 shows the memos that exist in your Palm device when you buy it, plus a few added ones. You can either create notes on your desktop computer and transfer them to your Palm device to keep critical information handy, or you can create memos on your Palm device for later transfer to desktop computer programs, such as your word processor. Figure 3: The Memo list stores any kind of text that you want to keep handy. Preferences: This program lets you customize your Palm device by changing application button assignments, time and number formats, modem setup, and shortcuts. Security: This program lets you hide or show all the items that you’ve marked Private on your Palm device. You can also set, remove, or change a password to protect your information. To Do List: Here’s a list of tasks that you need to remember, sorted by order of priority, due date, or by the name of the task. You can also keep track of tasks that you’ve completed on the To Do List for reference.